1 What is incremental reading? Incremental reading is a learning technique that makes it possible to read thousands of articles at the same time without getting lost. Incremental reading begins with importing articles from electronic sources, e.g. the Internet. The student then extracts the most important fragments of individual articles for further review. Extracted fragments are then converted into questions and answers. These in turn become subject to systematic review and repetition that maximizes the long-term recall of the processed texts. The review process is handled by the proven repetition spacing algorithm known as the SuperMemo method. Warning! Incremental reading may seem complex at first. However, once you master it, you will begin a learning process that will surpass your expectations. You will be surprised with the volume of data your memory can process and retain! Incremental reading widely stretches the span of your attention. You will notice that a single paragraph in an article may greatly reduce your enthusiasm for reading. If you stumble against a few frustrating paragraphs, you may gradually develop a dislike of reading a particular article. You may even become fed up with reading for the entire evening. Incremental reading makes it possible to immediately move on to other pieces of information reducing the negative impact of frustration. It also makes it possible to split larger pieces into less intimidating portions. It allows you to read interesting bits before reading the boring bits. Those measures dramatically increase your attention. They also make reading fun. A skilled incremental reader is likely to develop an addiction to learning with all related benefits! See also: incremental reading from user's perspective by Len Budney. After importing an article about the greenhouse effect from Wikipedia (e.g. 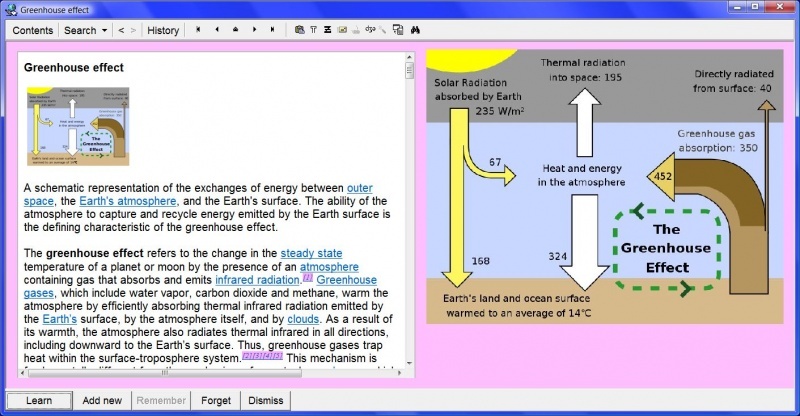 with Edit : Import web pages : Wikipedia (Shift+Ctrl+W)), its text is stored in a single topic. Before you start reading articles, you can place the Read toolbar in an easily accessible location on your screen. The toolbar may be helpful before you learn to use the keyboard to access all its functions. Choose Window : Toolbars : Read, place the toolbar in a convenient place on the screen and press Shift+Ctrl+F5 (to save the current layout of windows as your default layout). If you do not see the Window menu, read about Levels. Click the article to enter editing mode, in which you can modify text, select fragments, etc. Extract texts: If you encounter an interesting text in the article, select it with the mouse and choose Reading : Remember extract on the Component menu (or simply press Alt+X). Alternatively, you can click the green T icon on the Read toolbar ( ) or on the Element toolbar. This operation will introduce the extracted fragment into the learning process as an independent mini-article. If you would like to specify the priority of the new extract, choose Reading : Schedule extract (checked T icon on the Read toolbar) instead of Remember extract. Also, if you have an impression that the article is difficult and you would like to read some fragments later, extract those fragments with Reading : Schedule extract and provide a review interval that will reflect the time you believe you will be better equipped to understand the extracted fragment. Optionally, if you read a fragment that seems unimportant, then select it (e.g. with the mouse) and either delete it (e.g. with the Del key) or mark it with the ignore font. To mark it with ignore font, choose Reading : Ignore on the Component menu (or click the stop-sign icon on the Read toolbar). Optionally, if the selected fragment does not include all the important reading context, you will need to add this context manually. For example, if you are learning history, you may extract the following fragment from an article about Lincoln: On Sept. 22, 1862, President Lincoln issued the Emancipation Proclamation, one of the most important messages in the history of the world. He signed it Jan. 1, 1863. If you would like to extract the fragment related to signing the Emancipation Proclamation, you will need to change He to Lincoln and it to Emancipation Proclamation so that your stand-alone fragment is understandable: Lincoln signed the Emancipation Proclamation on Jan. 1, 1863. You can use the Reference options on the Component menu to easily add context to your extracts (see: References). Context added by Reference will be added automatically to all extracts of a given article. For example, select the text that you want to serve as the reference title of all extracts and choose Reference : Title on the Component menu (or press Alt+T). This text will appear at the bottom of all extracts (in reference pink font by default). Mark your last reading point: Once you decide to stop reading the article before its end, mark the last processed fragment as the read-point (e.g. with Ctrl+F7 or by choosing Reading : Read-points : Set read-point). Next time you come back to this same article, SuperMemo will highlight your read-point and you will be able to resume reading from the point you last stopped reading the article. To go to your current read point, press Alt+F7. If you forget to set a read-point, SuperMemo will leave a read-point at the place of your last extract. Go to the next article: After you finish reading a portion of one article, choose Learn or Next repetition to proceed with reading other articles. Those buttons are located at the bottom of the Element window. You can also use Enter, which will work as long as the selection in the text is not empty (e.g. marked as a reading point), or if you have left the editing mode (e.g. with Esc). If the text selection is empty, Enter will add a new line in the text (as is the case with other standard text editors). lack of time: if you still have many articles for review for a given day and your time is running out, keep your increments shorter. After some time, being in a hurry will be a norm and you will tend to read only 1-2 paragraphs of each article and dig deeper only into groundbreaking articles that will powerfully affect your knowledge. boredom: if the article tends to make you bored, stop reading. Your attention span is always limited. If your focus is poor, you will benefit more from the article if you return to it after some break. Go on to reading something that you are not yet tired of. If SuperMemo schedules the next review at a date you consider too late, use Ctrl+J or Shift+Ctrl+R to adjust the next review date. lack of understanding: if you feel you need more knowledge before you are able to understand the article, postpone it (e.g. use Ctrl+J or Shift+Ctrl+R and schedule the next review in 100 days or so). If you believe you have already imported articles with relevant explanatory knowledge, you can search for these articles (e.g. with Ctrl+F) and review or advance these articles now (e.g. with browser's Learning : Review all or Advance : Topics). If you have not yet imported any explanatory articles, you could do it now (e.g. search the web and import articles as explained before). Note that you can select a piece of text in SuperMemo and use Ctrl+F3 to search encyclopedias or dictionaries for more material on a given subject. lower priority: read lower priority articles in smaller portions thus reducing the overall time allocation for the related subject. Once you complete reading the entire article and have extracted all the interesting fragments, press Shift+Ctrl+Enter (or Learning : Done on the Element menu). This will dismiss the article, i.e. remove it from the review process, and delete the contents of the processed article (without deleting the extracted material). Done will delete a childless article (i.e. an article that did not provide interesting extract or whose extracts have been processed and moved to various Categories). Using Done will greatly reduce the size your collection and eliminate "dead hits" when searching through your collection. Warning! Some texts rich in pictures and tables may be handled with difficulty by SuperMemo. It may be very useful to learn to use HTML filters (press F6). See: Problems with HTML. Some of those problems stem from bugs in Internet Explorer that SuperMemo employs to display and edit HTML. This particularly refers to Internet Explorer 6. It is therefore highly recommended you install Internet Explorer 7 or later to make your life easier. With a dose of patience, you will learn to work around these problems. In the course of traditional reading, we often mark important paragraphs with a highlighter pen. In SuperMemo, those paragraphs should be extracted as separate mini-articles (elements) that will later be used to refresh your memory. Each extracted paragraph or section becomes a new element that will be subject to the same reading algorithm as discussed above. Extract important fragments and single sentences with Remember extract (Alt+X). Remember to add necessary context to make sure that the extracted fragment does not become meaningless with time. You can use the Reference options on the Component menu (esp. Alt+Q) to easily add context to your extracts. For example, select the title of the source article and press Alt+T (Reference : Title). This way, each extract will be marked by the title of the source article. If you fail to provide the context, you can use the reference link button ( ) on the Element toolbar to jump to the source article from which the extract was produced. In the picture (click to enlarge): typical snapshot of incremental reading. While learning about the greenhouse effect, the student extracts the fragment saying that "In the absence of the greenhouse effect and an atmosphere, the Earth's average surface temperature of 14 °C (57 °F) could be as low as -18 °C (-0.4 °F), the black body temperature of the Earth.". The extracted fragment will inherit illustrations placed on the right, as well as article references. The student can move on to reading another article by pressing Enter. The picture on the right is stored locally in the Image Registry (on the user's hard disk) and can be reused to illustrate other articles or questions. SuperMemo will show you that extracting important fragments and reviewing them at later time will have an excellent impact on your ability to remember and benefit from your learning material. However, it will also show that once the time between reviews increases beyond 200-300 days, reading and re-reading (passive review) will often result in insufficient recall of the material. For this reason, sooner or later, you will need to use Remember cloze by selecting text that you wish to remember and pressing Alt+Z (or clicking the blue Z icon ( ) on the Read toolbar or on the Element toolbar). Remember cloze will help you convert a sentence into a series of questions with answers. This way you will move from passive review to active recall. You do not need to wait until a paragraph or a sentence becomes hard to recall in passive review. For your most important material, you can create cloze items immediately after finding a piece of information that you need to remember well. The examples below show how to effectively use Remember cloze. Two numbers from the extracted sentence are used as keywords for generating questions and answers (temperatures of 14 °C and -18 °C). In the picture (click to enlarge): the sentence extracted during incremental reading (see the previous picture) is converted into a cloze deletion. (i.e. 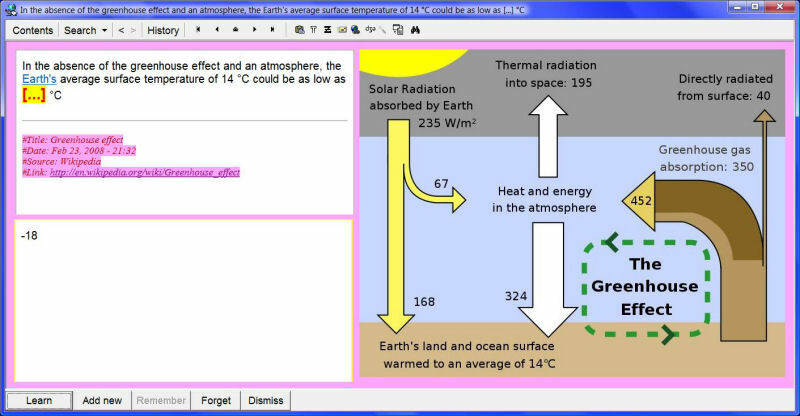 a question-answer pair forming the final product of incremental reading used in strengthening the memory of a given fact (here: hypothetical temperature on Earth devoid of atmosphere)). The picture from the original extract has been inherited (on the right). 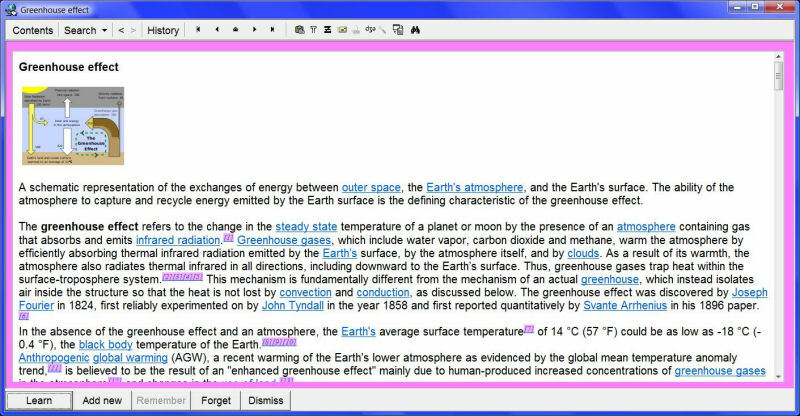 Pink texts at the bottom of the question are references generated automatically when importing an article from Wikipedia. As for the precious information "lost" during the editing, it can (but does not have to) be learned independently with separate questions generated by Remember cloze. clearer purpose of the question: the fact that the question is about the year in which the Internet began is emphasized by using the red-colored (year) hint. brevity: by removing superfluous information, you will not waste time on information that is not likely to be remembered (only actively recalled material will be remembered for years). You will answer the question and never focus on which universities were originally connected by the early Internet. If you believe this information is also important, you will use the original extract to produce more cloze items that will focus solely on the universities in question by naming them in the answer field (if you disagree, read: 20 rules of formulating knowledge). understandability: "the ARPA agency" phrase may defy grammar rules you have learned in primary school, but it is by far more understandable than just the ARPA. In SuperMemo, understandability is more important than stiff rules of grammar or spelling! SuperMemo is based on repetition. You make repetitions of the learned material in order to ensure that your knowledge retention (i.e. your ability to recall facts) reaches the desired level (usually 95-98%). In SuperMemo, incrementally processed articles will also be subject to repetition. We will often use the more intuitive term review in reference to incrementally processed material; after all, when you resume reading an article after a certain interval of time, you are not actually repeating anything. You are simply reading new sections of the same material and extracting newly acquired wisdom into separate elements with Alt+X (i.e. Remember extract). The algorithms that determine the timing of (1) repetitions of question-and-answer material and (2) reviewing reading material are analogous but not identical. Most importantly, all repetitions and article presentations happen in increasing intervals by default. In incremental reading, you will see a constant inflow of new articles into your collection. Unprocessed material will need to compete with the newly imported material. Increasing review intervals make sure that your old material fades into lower priority if it is not processed quickly. The speed of processing will depend on the availability of your time and the value of the material itself. Articles that are boring, badly written, less important for your work or growth, will receive smaller portions of your attention and may go into long review intervals before you even manage to pass a fraction of the text. That is an inevitable side effect of a voluminous flow of new information into your collection and into your memory. However, intervals and priorities can easily be adjusted. If the priorities change, you can modify the way you process important articles. At review time, you can either read the entire article without interruption, or revert it to a shorter interval. You can manually change its priority (e.g. with Alt+P). You can also use search tools (e.g. Ctrl+F) to locate more articles on the subject that you feel you have neglected. You can reprioritize a bunch of articles by changing their priority; you can shorten their interval or review them all when needed (see subset operations in the Browser). The algorithm for reviewing questions and answers (e.g. cloze deletions) is quite complex and limits your influence on the timing of repetitions (see: SuperMemo Algorithm). This is to ensure a high level of knowledge retention, which might be compromised by manual intervention. However, the algorithm for determining inter-review intervals in incremental reading is much simpler and is entirely under your control. Each article receives a specific priority. The priority determines which articles are reviewed first and which can be postponed in case you run out of time. Each article is also assigned a number called the A-Factor that determines how much intervals increase between subsequent reviews. For example, if A-Factor is 2, review intervals will double with each review. Priority and A-Factors are set automatically, but you can change them manually at any time. Both are determined heuristically on the basis of the length of the text, the way it is processed, the way it is postponed or advanced, and by many other factors. Long texts will receive low A-Factors (e.g. 1.1), while short extracts will receive higher A-Factors (e.g. 1.8). Manually typed texts have higher priority and lower A-Factors than automatically imported texts. You can change the priority and A-Factor of an article by pressing Alt+P. You can also use Shift+Ctrl+Up and Shift+Ctrl+Down to increase or decrease an element's priority. Note that A-Factors associated with items cannot be changed by the user, as they are a reflection of item difficulty that determines the length of optimum inter-repetition intervals (see: Forgetting index). You can control the timing of article review by manually adjusting inter-review intervals. Use Ctrl+J (Reschedule) or Shift+Ctrl+R (Execute repetition) to determine the date of the next review. Ctrl+J will increment the current interval, while Shift+Ctrl+R will first execute a repetition and then set the new interval. For example, if your current interval is 100 and you specify the value of 3 in Reschedule, your new repetition date will be set in 3 days, and the last repetition date will not change (if the repetition was to occur today, your new interval will be 103). If you do the same with Execute repetition, your new interval will be 3 and the last repetition date will be set to today. In other words, Reschedule increments the interval (it can also shorten intervals), while Execute repetition sets the length of the interval. Note that Reschedule executed during the repetition cycle will first complete the repetition and will have the same effect as Execute repetition. In heavily overloaded incremental reading, you will often want to learn only a portion of material related to a given subject. For that purpose, read about the priceless concept of subset learning. In incremental reading, you may quickly import and produce more learning material than you can effectively process. To make sure that your learning does not suffer from overload, you should use the priority queue. Using Alt+P (Learning : Priority : Modify on the Element menu), you can set each element's priority from 0% to 100%. Remember that 0% corresponds with high priority while 100% with low priority. By default, your outstanding repetitions will be auto-sorted from high to low priority. This way, if you fail to complete your daily load of learning, it will only be the lower priority material that will suffer. Also by default, at the beginning of your working day (i.e. at your first run of SuperMemo), your outstanding material from previous days will be be auto-postponed (again with high-priority material being least affected). turning off auto-sort and auto-postpone, and more. If you are serious about studying, you should learn incremental reading! Without it, you might be missing the best part of SuperMemo! Incremental reading makes it possible to read thousands of articles simultaneously without getting lost. Standard repetitions and incremental reading could best be intermingled for the sake of variety and creativity. Auto-sort repetitions will sort your repetitions, introduce a tiny degree of randomness, and ensure a steady, moderate, and prioritized inflow of new articles into the learning process. Read more about the priority queue. You can control the timing and priority of review in incremental reading by modifying intervals (Shift+Ctrl+R or Ctrl+J), priority (Alt+P), the forgetting index (e.g. Shift+Ctrl+P or Shift+Ctrl+Up/Down), and even A-Factors (e.g. Shift+Ctrl+P or Shift+Ctrl+Up/Down). Use read-points (Ctrl+F7), good titles (Alt+T), reference labels (Alt+Q), and manually inserted context clues to minimize context recovery overhead (i.e. the cost of recalling the correct context of individual questions). Auto-postpone will automatically delay the review of the excess of lower priority material. Use Postpone to manually handle the overload or define the postpone criteria. Never use Postpone on top-priority material! Do not forget to review 20 rules of formulating knowledge to make sure you do not waste hours on badly formulated material. See Devouring Knowledge for more about incremental reading in the context of learning optimization. See Incremental reading from user's perspective by Len Budney. Incremental reading might be as important for SuperMemo as the original repetition spacing algorithm. Incremental reading eliminates a number of bottlenecks that limit the first stage of learning: knowledge acquisition. Older SuperMemos: In the years 1987-1998, users of SuperMemo had only two alternatives in the area of collecting learning material for learning with SuperMemo: (1) type it in and formulate it manually or (2) obtain ready-made learning material from colleagues, SuperMemo Library, etc. The only way SuperMemo supported learning from electronic sources was via Copy and Paste. SuperMemo 99 made the first step towards efficient reading of electronic articles by introducing reading lists and the first primitive reading tools: extracts and clozes. Reading lists are prioritized lists of articles to read. Extracts make it possible to split larger articles into smaller portions. Clozes make it possible to convert short sentences into question-answer format by means of cloze deletions. SuperMemo 2000 greatly increased the efficiency of reading by introducing the concept of incremental reading. Incremental reading makes it possible to simultaneously read dozens of articles. Each article is read in small increments fully controlled and prioritized by the user and/or the default learning process. Components of incremental reading introduced in SuperMemo 2000: new A-Factor-based topic repetition scheme (i.e. learning algorithm), read points, formatting in extracts and in clozes (SuperMemo 99 would ignore formatting), text highlights, source article link, reading toolbar, subset learning, subset postpone, and support for longer articles (SuperMemo 99 was limited to 64K articles). SuperMemo 2002 brought incremental reading to a new level. For SuperMemo 2002 incremental reading become the primary learning mode for middle-level and advanced students. SuperMemo 2002 introduced HTML-based incremental reading. For the first time, the user would see little difference between the material in his web browser and in SuperMemo. Other new features introduced by SuperMemo 2002: wholesale learning material import from Internet Explorer, mid-interval repetitions that make it possible to review portions of material without damage to the learning process (Algorithm SM-11), search-based learning (i.e. subset learning in which the subset is defined by advanced search tools), dynamically modified A-Factors that fine-tune the priorities without user intervention, postpone wizard that makes reading lists obsolete, separate topic/item statistics and new incremental reading progress statistics, reference labeling, and more. SuperMemo 2004 has been developed solely with the view to perfecting the tools used in incremental reading. The data collected from months of actual incremental reading have been instrumental to enhancing the algorithm and the tools. Fine tuning of the modification of topic A-Factors enhances the optimization of new material review in a heavily overloaded process. New tools include: rich statistics for monitoring and optimizing the learning process, tools for handling excessive delays in review, browsing sources of extracts and clozes, one-key reference labeling, proliferating remote images, easy integration of remote images, and more. SuperMemo 2006 made a major step in rationalizing the overload of the learning material in incremental reading by introducing the priority queue. It makes it easier to import articles from the Internet (esp. from Wikipedia). Material overload is handled with auto-postpone and auto-sort tools. SuperMemo 2006 simplifies importing, arranging, compressing, converting, zooming, and trimming pictures. SuperMemo 2006 can now pick any folder on your hard disk and convert all your file archives into material that can be processed incrementally (e.g. article archives, picture archives, family albums, movie clips, documentation files, or assorted archives). SuperMemo 2006 also makes it simple to do one-key searches and import of auxiliary learning material on the web with customizable tools (e.g. Google, encyclopedias, dictionaries, picture archives, etc.). SuperMemo 2008 extends incremental reading into the areas of pictures, sounds and video (see: Visual learning and Incremental video). Imports from the web, esp. Wikipedia and YouTube are now simpler, and make it easy to set priorities, references, categories, etc. 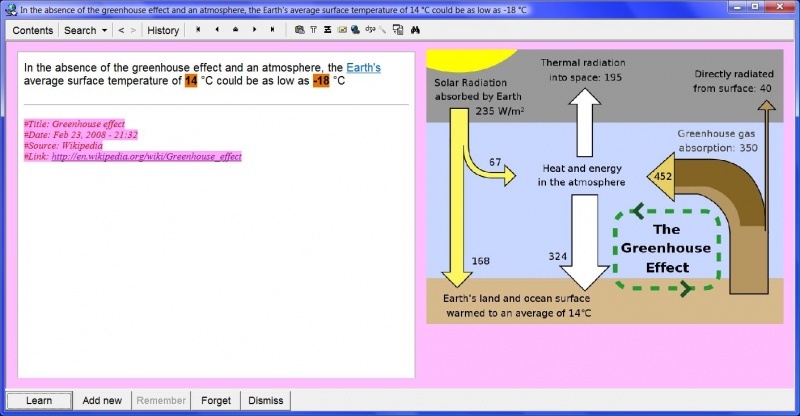 SuperMemo 2008 also simplifies and automates the process of creating learning material references.